This violet-colored inflammation (erythema) over the knuckles is caused by Dermatomyositis. 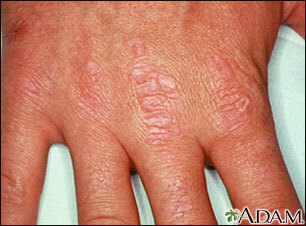 Other skin conditions produce more redness, while the color of this lesion is violet. There may also be inflammation in the muscle tissue.